​Concrete comes in different grades or strengths. Normally the engineer specifies the design strength of the concrete, which may vary for different parts of the building. Using concrete which is under strength will lead to problems with the structure, which could cause cracking and in the worst case catastrophic failure of the building. Using concrete of a higher strength or grade than required is more expensive. Concrete can be mixed on the building site, usually using a mechanical mixer. or it's ordered from a ready mix concrete supplier which delivers the concrete in concrete spinner/ready-mix trucks with revolving drums which continually mix the concrete. When ordering concrete it's important to specify the grade or strength and the amount of concrete required. Concrete is a mixture of cement, water, sand and stone. The strength of concrete depends on the ratio of cement to water. The more cement the stronger the concrete, while the more water the weaker the concrete. More water usually also means that the concrete shrinks more as it dries, which usually causes shrinkage cracks that are unsightly and which allows moisture to penetrate the concrete. Adding stone reduces the amount of water. But too much stone means that the concrete will be difficult to work with and there will be voids between the stones. It’s important to note that the stone should be clean and free of dust and dirt, since the dust and dirt will require more water, which will make for a weaker concrete unless more cement is added. Stone should be generally of a uniform size. Sand helps create the cement paste that fills the voids between the stones. Sand should be clean and free of contaminants, such as roots, sticks, rubbish and impurities. Not all sand is suitable for concrete. The best sand is a river sand which is of even grading. Sand which is too fine will require more water to wet it, and as already discussed more water means more cement or a weaker concrete. When the sand is very course the concrete may have voids, or be difficult to compact. If the sand is very wet then less water should be added to the mixture. Where possible sand for concrete should be kept dry and covered when there’s lots of rain. Sometimes, depending on the available sands and stone it may be necessary to blend two sands together. Sand, water, cement and stone must be well mixed so that the cement is evenly spread through the mixture and there are no lumps of material. The mixture is now known as concrete. ​Concrete usually begins to set within four hours of being mixed. The time will be shorter when it’s very hot. The setting time will be extended when it’s cold, or when retarders (certain chemicals) are added. In fact, add sugar and the concrete will never set. So concrete should be placed and compacted as soon as possible. When concreting bigger structures it’s important to ensure that the first concrete placed doesn’t dry out before the next load of fresh concrete is added next to it. So it’s good practice when pouring slabs and beams to start pouring from one side of the structure, first bringing the concrete to the top surface, then steadily advancing with each new load of concrete, ensuring that the fresh concrete knits with the older concrete. If the new concrete is placed against older concrete that has already started to set it won’t join properly and there’ll be a ‘cold joint’ (visible joint) which is unsightly and weakens the structure, even meaning that the structure is unsuitable and should be condemned. It’s therefore critical to schedule concrete deliveries at the correct frequencies, so that there isn’t a long gap between trucks and also so that trucks are not standing, waiting for previous trucks to be offloaded, meaning that the concrete is already starting to set. You must place the concrete at a fast enough rate so that the concrete doesn’t start setting before fresh concrete is added. 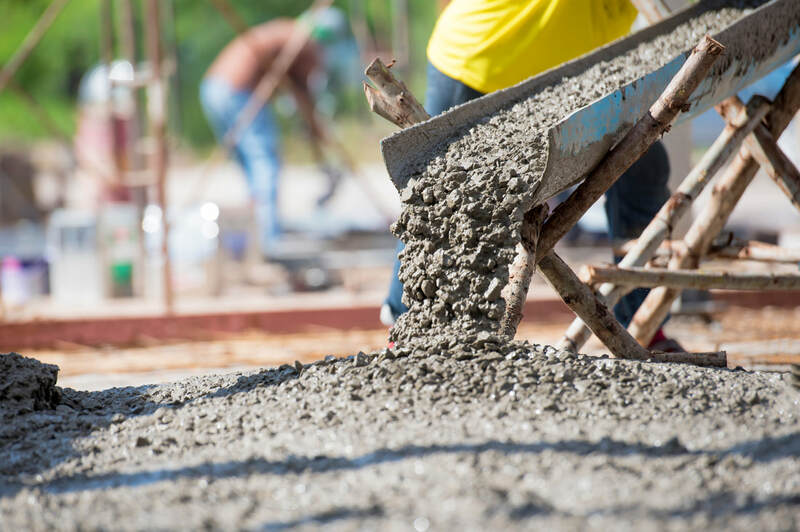 Concrete is best compacted by mechanical vibrators, or compactors, to ensure there’re no voids in the structure and to bring some of the concrete water to the surface. Concrete shouldn’t be over compacted. The concrete mixture should always be workable, having sufficient water, cement and sand so that it can easily flow into voids, between and around reinforcing steel, and so it can be readily compacted and worked with. However, construction crews should never add additional water to the concrete mix to make it more workable. Remember the golden rule, more water equals weaker concrete! Only the mixing crew should add more water, plus the required additional cement. As the concrete starts to set the top surface should be finished and smoothed off. The final finish will depend on what will come on top of the concrete. Floors that will have a carpet or vinyl floor finish will be required to have a smooth (‘steel float’) finish. Floors that will be covered with tiles may only require a rougher finish. However, in all cases it’s important to ensure that the top surface of the concrete is finished to the correct required levels without dips and humps. A smoother finish takes longer, so can be more expensive. A very smooth finish could be unsuitable when other layers are added, say when a screed is to be placed over the concrete. Painting the surface of the concrete with a curing compound. Wrapping the concrete in a plastic membrane. Wrapping the concrete in hessian or sacking which is then kept wet. Forming ponds or dams on slabs (building sand walls) and keeping these ponds filled with water. Extra care needs to be taken when it’s very hot or windy as this will accelerate the drying process. The concrete will need to be worked smooth quickly. Cold joints will form more easily so the next load of concrete must be placed sooner. It's important that those working with concrete ensure that the correct grade of concrete is used. As soon as the concrete is mixed, or it's delivered to the project, it should be poured or placed into the structure. Concrete that's too dry or that has too much stone is difficult to work with and won't always get into all the corners and around the reinforcing in the structure. Concrete that's too wet will often have excessive cracks in it when it dries. Care should be taken not to add additional water to the wet concrete since this weakens the concrete. Adding additional water usually means you should also add more cement. Concrete must be thoroughly compacted and care must be taken to ensure it's finished to the correct level and worked smooth. Using the wrong grade of concrete, adding additional water, using unsuitable sands or contaminated materials, not compacting the concrete correctly, allowing the concrete to set before the next batch of concrete is added, or failing to cure the concrete correctly, could result in excessive cracking and a weakened structure which will cause problems for your new house. ​For more valuable tips and advice read: Build and Renovate Your Home With Your Eyes Wide Open. ​People are starting to become more environmentally-conscious. Then again, the growing concern for the environment is understandable. After all, global warming is starting to impact many. Some areas are becoming hotter and dryer while other areas are impacted by more frequent and more severe storms. But being environmentally conscious isn’t only about helping our planet, it’s also about helping our pockets. Home energy bills are rising, and they are only going to increase further – especially if we have hotter summers. Wouldn’t we all like to cut our household energy bills? But there are other benefits, building smart houses often means that we have cooler more livable homes in the heat of summer and warmer houses in winter. Who wouldn’t want a more comfortable home? 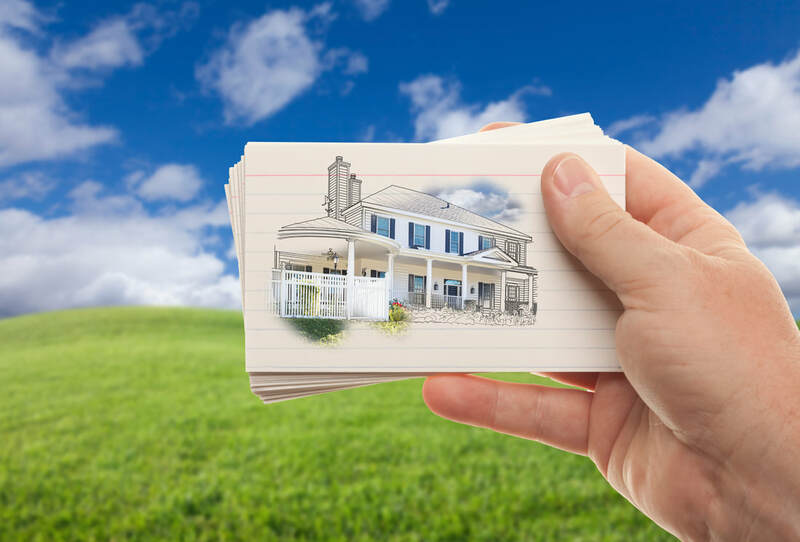 Since more people are demanding eco-friendly and environmentally sustainable homes, designing and building a home with these features will make it more appealing to buyers in the future should you decide to sell your home. So, the best place to start being more conscious about the environment is our very own homes. Let’s take a look at what you can do to have a home that’s friendlier to the environment. Admittedly, installing solar panels requires a more significant investment than most people are comfortable with. But the sun will always be the best source of free and clean energy we’ll have. And while it can be expensive to install, powering your home with sunlight will be much cheaper in the long run. It will also help reduce your dependence on fossil fuels, which is already a huge favor for the environment. Adding battery storage (which is becoming cheaper) will allow you to become totally independent from utility providers. LED light bulbs use up to 75% less electricity. And they also last for many years, unlike incandescent bulbs that are very inefficient and have much shorter lives. Even when you’re using LED light bulbs you’re still using electricity to power them. If the sun is up, why use light bulbs to illuminate your interiors when you can let sunlight into your home via skylights? Aside from its apparent eco-friendliness, installing skylights also brings a myriad of health benefits, as sunlight can help us sleep better and boost our body’s production of Vitamin D as well. We live in a world where manufacturers are doing their best to design products that are more eco-friendly. The plumbing products industry, for example, is now selling everything from water-efficient shower-heads to toilets that use a lot less water than older models. Installing these products in your home will help minimise water wastage and reduce water bills without impacting how you live. Many people live in water scarce areas and water is becoming a valuable product which needs to be saved and protected. The air quality in your home is a good indicator of how eco-friendly your home is. For cleaner indoor air, you might want to put houseplants inside. They filter the air and provide additional oxygen as well. Sustainable materials are the way to go if you’re building or remodeling your home. Green materials like bamboo and cork, for example, would be suitable for your flooring. It would also be great if you use solvent-free natural products which are less harmful to your family and the environment. Whenever we do something eco-friendly, we aren’t just helping the planet, but we are often helping our family by creating a more liveable home, and of course we are also helping our pockets by cutting our utility bills. So why not become friendlier to the environment, starting inside our homes. Victoria Grace is the Content Specialist for Nucleus Construction, a Phoenix-based company that specialises in remodeling and building custom homes. When not writing, she enjoys reading books and riding her motorcycle. Read this story - a very expensive lesson for the house building contractor, both in cost and loss of reputation. A stressful and expensive experience for the home owners. Read: The estate where neighbours began to vanish It's almost more frightening than a ghost story. Last week I discussed decisions that influence your choice of home and it's design. ​In this article I discuss how your family and your lifestyle impact choices and what you should consider. 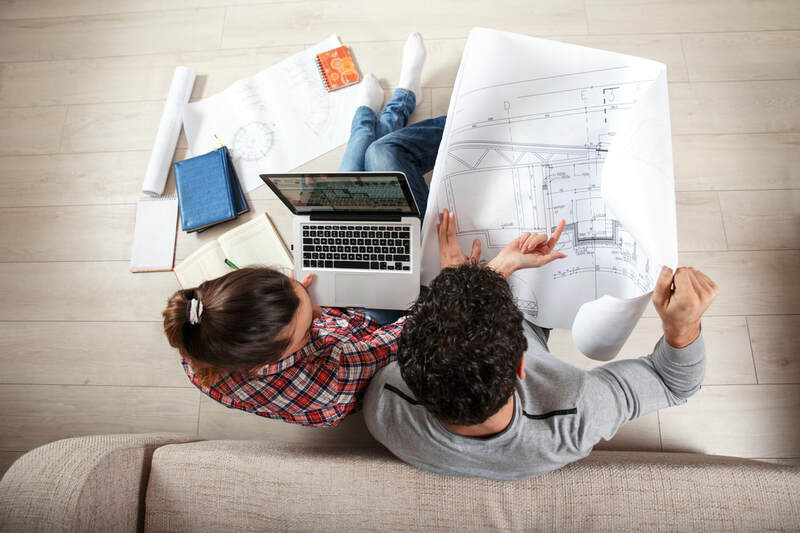 Embarking on designing and building a new house, or renovating your home, is going to be even more difficult if there isn’t agreement with your partner. Thousands of design and home decorating decisions will have to be made. Establishing some common ground as to the size, general layout, overall architectural theme and the location of your new home is essential. Failure to discuss your thoughts and to understand your partner’s point of view could lead to one of you being unhappy with your new or renovated house, or even both of you. Not agreeing principles as the home design progresses could lead to designers and contractors being pulled in two directions, inevitably leading to changes while the house is being constructed, which will be costly. Even more costly will be changes after construction of your home is complete. Understand that some compromise from both sides will be necessary, but always ensure that these compromises aren’t going to result in an architectural mishmash of ideas, that looks terrible and doesn’t satisfy anyone. So, at an early stage visit homes together, look at the same magazines and review house plans. Narrow down the choice of house plans and styles to those that you both like – which might not have been your first choice for your new home. Where you disagree over designs, colours and features with your partner, argue the case logically with the pros and cons. Be prepared to change your mind if you’re wrong, or make adaptions where necessary. You may involve the children in some of the home design and planning processes, but you shouldn’t be too side-tracked by what they want. Yet, it’s important to consider their changing needs and how the house can be adapted to fit these needs. So, a home for children under five could be different to a home for children between five and thirteen, while older children will have different needs. It’s important to provide them space in the house which can be changed and adapted. Space to play, space to study and space to entertain friends. Your lifestyle will dictate the requirements of your house, it's design, layout, finishes and style. So consider some of the following questions and how they'll influence your design decisions, how the answers will influence what should be included or excluded in the house design. Do you entertain lots? If so you may need bigger entertaining areas, possibly a larger kitchen. Maybe be able to easily separate the entertaining areas from the bedroom. Is there a big family? This will impact the number of bedrooms and bathrooms. Even the amount of parking. Do you like the outdoors? If so you may want a larger garden and a nice outdoor area so you can sit outside. Do you like gardening? If not a smaller garden and a garden with low maintenance is important. Do you enjoy sitting in the garden? Do you travel lots and want an easy care house? If you plan to be away often you want a secure home that requires little care. Do your children have friends visiting often? If so you may require a separate entertaining area for them. Do you like cooking? This will impact the size, layout and even the appliances in the kitchen. Do you like long relaxing baths? A large bath might be important for you. Is privacy important? This impacts the internal layout of the house, plus what the neighbours and those on the road can see in your house and garden. Do you need your own space to do work? What kind of space? A separate study, maybe even a hobby room or workshop? Do you have visitors or family that stay over? You might require an extra bedroom, maybe even a suite with bathroom that can be separated from the rest of the house. Will you and the family use a swimming pool? Swimming pools are a lot of work. If you're planning a swimming pool make sure that you and the family will use it regularly and for years to come. How many cars do you have? Do they require a garage? How much parking do you require on the property? Are you good at repairing things? You may want an easy to maintain house. Are you a hoarder with trinkets and ornaments? Maybe you need shelves, even glass fronted cabinets. Do you have an art collection? You’ll need wall space then, and the right lighting. Do you have lots of clothes? How much cupboard space do you require? Do you like simple clean lines? A more modern house might suit you. Do you have a collection of books? If so you'll need space for bookshelves. Are you a tidy person? You might want lots of cupboards. But what about the design of the cupboards - do you need a specific place for everything? Do you like the latest technology? Maybe you want stuff that can open and shut on command? Do you want to feel part of the neighbourhood, or don’t you want to see or hear the neighbours? Do you like the latest fashions and styles, or are you more of a vintage person? Do you have a big wine collection? Maybe you require a wine cellar, or at least a cool area to store your wine. Do you like listening to music? Is protecting the environment important to you? This will impact the materials you use for constructing the house. Do you like pets? What pets? How important are they in your life? Dogs usually need outdoor space. Areas inside the house where the animals will wander should be easily cleaned - possibly tiles on the floors instead of carpets. Do you use public transport? This will impact the location of your house. Do you work from home? If so you will require an office. If there are work visitors then the office must be large enough for you and the visitors and possibly you should consider a separate entrance to the office. Maybe you need additional storage for your work stuff. Do you, or a member of the family, need space for a hobby? Probably your new home can't have everything you would like it to have. After all there's usually only so much money and so much space that you have available. But anyway, would you really be happy with a huge mansion that costs a fortune to run, clean and maintain? But it is possible to balance the needs of your partner and family with your likes and needs, while keeping your new home build project in budget. Carefully consider what you like and dislike as discussed in my previous article. Collect home design and decorating ideas from various sources. Don't just rush for the first plan or style that appeals to you. Really understand you lifestyle and make sure that the plan, layout, design and finishes of your new home will fit your lifestyle and the way you live. We are all different, so not every house will satisfy your needs or lifestyle. Take time to plan and design your house so that it will satisfy your and your family's needs when you're living in it. Get the design of your new house right before starting construction. Changes during construction or after the house is complete will be expensive. So many questions and decisions might seem overwhelming and confusing so it's important to take a logical approach. Make lists of likes, wants, needs, dislikes and disagreements. Tick off items as they're taken care of. Don't make rushed decisions which you could regret when you move into your new home. ​What kind of house do you want to live in? What houses do you like? ​Before designing that new house, renovations or additions, it’s wise to sit down and decide what you want. Do you want a house or an apartment, how many bedrooms, the number of bathrooms, what size rooms, do you need a garden and how big, do you require parking for vehicles and does this need to be undercover and secure, where is your desired location, what is the style you would like, and what kind of fixtures, fittings and finishes are you looking for in your new home? It’s useful to visit houses that are for sale – even if they’re in the wrong location or out of your price range. They frequently offer opportunities to gather ideas – to see what features, styles, layouts and houses you like and don’t like. Even if you don’t like a house don’t simply rush out, but take your time looking around. Understand why you don’t like the house – are there particular features, styles or layouts that put you off? Are there some features that you do like – what and why? Always keep in mind the various prices. Understand why some houses are more expensive than others. Know what can be purchased with your budget. You may want to live in a multi-million dollar dream home that’ll grace the cover of popular home and garden magazines – yet for most of us this is a dream that isn’t going to happen, and anyway it's usually unnecessary and doesn't guarantee that you will end up liking living in the home. Look through house and home magazines to obtain ideas for interior finishes and architectural styles. Visit display showrooms that offer various options for tiles, lights, bathroom fixtures and kitchens. See what can be achieved so that you and your family can live happily in the home. Scan the internet for ideas and styles that you like. Always try and understand why you like something, or why you don’t like it. Take photographs, make notes, collect brochures, collect pictures from magazines and the internet. Create folders of ideas. ​What do you need in your new home? ​Now this is where the voice of reason needs to step in. There’s often a competition between what you want and what you need. You may want an expensive sports car which, however, could be impractical if you require the car to take the family on vacation. The same goes for your house. We usually all want the best, state of the art, iconic, architect designed structures and yet we probably only need the basics. Though, you mustn’t confuse the word basics with producing something of poor quality, or of skimping on costs so you have a house that’s not fit for purpose. To go back to the car analogy, you may not need a sports car, but you’ll need a car that’s reliable, safe, that can accommodate the family, is comfortable and which retains resale value when you decide to sell it. You want to enjoy using the car. So too with your house, you want somewhere that you can enjoy living in, that will satisfy your and your family’s requirements, and that will be appreciated by others when the time comes to sell and move on. And yes, inevitably you will eventually sell and move on. Some home renovation projects are started on a whim – you saw something, a feature or style, and thought it would look nice. How often have you bought an item of clothing only to find when you got home that it wasn’t the right size, or wasn’t an item that you needed? Our closets are filled with items of clothing that have never, or seldom, been worn. Unfortunately building or renovating your house costs lots more money, and can’t simply be changed when you find it’s not suitable. You can sometimes return an article of clothing because it’s the wrong colour or size, but, increasing the size of a room, or ripping out floor tiles because you don’t like their colour isn’t so easy and often costs lots of money - if it can be done at all. So you simply shouldn’t one day get out of bed and decide you’re going to renovate and extend your house, then immediately call a contractor, or worse, get out the tools from the shed and start smashing down walls. It’s therefore important before embarking on a new home construction or renovation project that you list all the items required from your new house. This would then normally be the minimum set of requirements for the house. It’s always important to also consider your future needs, which might be characterised by short term and medium term needs. So for instance, if there’s a new baby on the way you may need that extra bedroom quite soon. If you’re planning to have more children, then maybe you need to be considering more than one extra bedroom. On the other hand, if your children are about to leave home, your current house which could seem very crowded right now, may in a few years suddenly have surplus rooms, so would it be wise to be adding an additional bedroom that may only be needed for a year or two. Your early design decisions and choices can live through the life of your home build and renovation project and come back to haunt you if they’re bad decisions. It’s important not to be impulsive, but rather to carefully consider what you and your family require, what you like, what you don’t like, what you can afford and what your abilities are. You should be clear as to why you want to build a new house, or why you’re going to renovate. In future articles I will discuss taking cognisance of what your family wants and needs, lifestyle considerations impacting your design choices and the impact of architectural styles - all ensuring that you design the best house for you and your family. For more valuable tips and advice read: Build and Renovate Your Home With Your Eyes Wide Open. ​Filing lawsuits against a contractor due to building disputes is a serious matter, and unfortunately it’s becoming more common. A long process awaits someone who prefers taking the situation to court. What is worse? The construction project is being compromised. Building process might be delayed or be completed with poor quality. Although some people assume disputes are inevitable on construction projects, establishing a systematic construction management process will help prevent the situation deteriorating and clients don’t have to suffer the crippling consequences of wasted time and additional money which often results from disputes. The easiest among the rest. One can negotiate most simple situations. The goal is for the client and builder to agree an equitable and achievable resolution. Either one of the parties, or both parties, should take the initiative to discuss things in a clear logical manner so that each party understands the issues and the possible solutions to resolve the problem. ​This method is not legally binding in any way, but is an effective strategy in settling a dispute. A mediation suggests the participation of a neutral third party to help those involved find a resolution. There would be someone to mediate to reach an agreement or reconciliation. Kind of like the negotiation above, but with an independent third party to guide the talks and provide advice when necessary. If parties decide to go for adjudication, this will include the participation of a neutral third party, but unlike with the mediation method, the adjudicator will give a decision. When the decision cannot resolve the dispute, then there is a potential court action. ​The arbitration method requires the participation of a neutral third party to assist the various parties in resolving the dispute. The cost of this process can be significantly higher than the other methods, even as high as the court proceedings. ​Another alternative method in resolving building disputes is through litigation. Litigation is done in courts of civil jurisdiction, involving a substantial application of certain rules and laws. In this process, a jury and a judge give a determination. A jury decides based on facts while a judge decides based on law. Litigation is your last resort. This involves a trial and is legally binding and enforceable, though it can also be appealed. 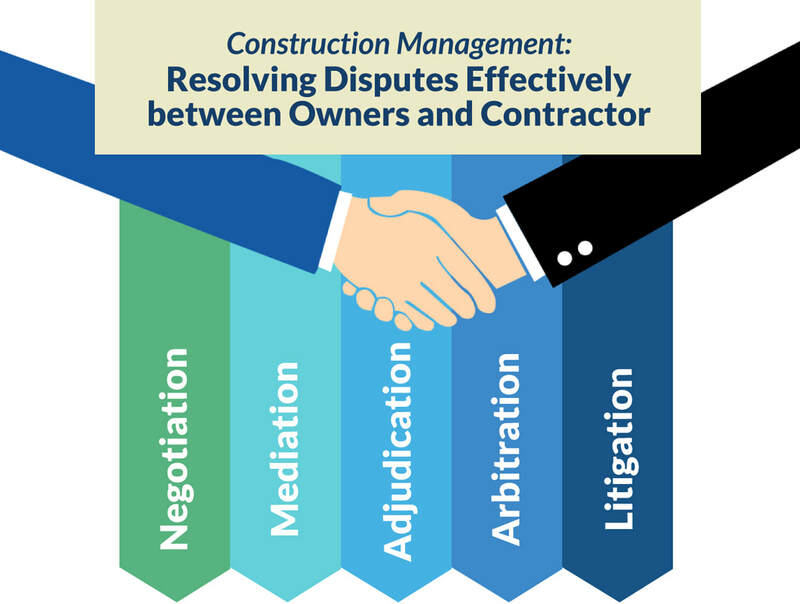 It is the most thorough, complex, slow, and costly way of resolving a construction dispute. A building dispute can be a stressful event for the parties. Situations can escalate quickly so it is better to resolve it immediately. Construction is not a piece of cake. Someone is investing a huge deal of money and expecting a highly functional home. Experiencing a building dispute can be too much for both homeowner and contractor. Unresolved construction dispute cases are increasing in the residential construction industry. Builders and subcontractors in smaller residential marketplace trust too much in verbal agreements. It is vital to have everything within signed documents or contracts. A verbal agreement will never help you resolve disputes. Even small projects can quickly escalate into disputes, which cost time and money to resolve, and invariably leave one or both parties with bitter memories of the project. You wouldn’t want to be part of the increasing number of unresolved construction dispute cases? About the Author: John Dela Cruz is the Principal Construction Lawyer of Contracts Specialist, Founder, and CEO of Small Builders Construction Software based in Sydney, Australia, and an industry influencer. He has been helping multiple homeowners, builders, and other tradesmen across the field for almost 10 years. He holds several industry management roles including Divisional President and Councillor at Master Builders Association NSW. ​We regularly hear of people buying houses, renovating them, then selling them at a profit. They’re called ‘flippers’. It seems an easy way to make money. There are even television programs about this topic. Often it is easy, but there are perils along the way. The transaction costs – which are agent costs, settlement fees and taxes. The holding costs – which is the cost of the money required to purchase and renovate the property, for the time it takes to complete the design, obtain permits, do the renovation and finally sell the property. This period could be twelve months or more. If you’ve borrowed the money the interest bill on the loan can be considerable. All the renovation costs as previously discussed. Taxes that you’ll pay on the profits you make. What buyers are looking for – how many bedrooms, bathrooms and garages, size of property, architectural style, finishes, etc. What buyers are prepared to pay – particularly in that area. What will appeal to buyers. Which neighbourhoods and suburbs are sort after. Prepare a realistic schedule so you know how long the project will take from the purchase to finally selling it again. Allow sufficient time to sell the house. You don’t want loan payments falling due before you’ve sold the house. Carefully research all aspects of the project so there aren’t unexpected costs or delays. Put you own emotions aside. Think what buyers will look for and like. Don’t only think of your profits. Remember there are no profits if potential buyers don’t like what you’re offering, so skimping on costs which delivers a substandard product will ultimately cost you money if you can’t sell the house. Think through everything that will be needed to make the house sell-able to the buyers that you’re aiming for. So, as in the previous section, turning a house into a luxurious house requires work on a number of elements. Missing an element could bring the value of the whole house down. Consider the total package, including the garden, driveway, outdoor living areas and the boundary fence or wall. Understand the opposition – what other similar properties are available which could be competing for the same buyers you’re aiming for. Not be overly ambitious, particularly with your first projects. Don’t commit to projects that require major work or complicated renovations. Not purchase the first property you see. There will always be other houses available. Sure you may miss one opportunity, but you could also be avoiding a problem. Of course, having said this, some houses can easily be transformed at minimal costs if they have the right bones and don’t require large structural modifications. In a future blog I'll discuss some simple ideas to transform your home. It is possible to make money by buying old houses and renovating or remodelling them. 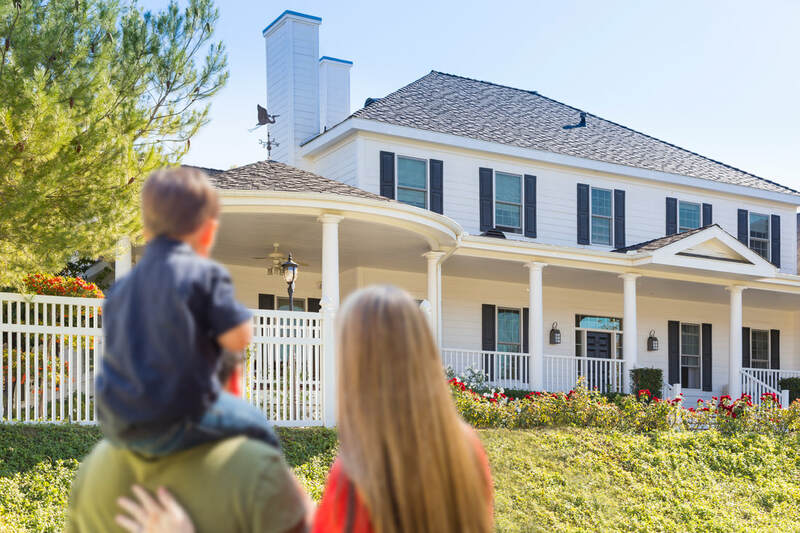 But, buying the wrong house, paying too much for the property, turning the house into something you want to live in rather than what prospective buyers are looking for, or planning ambitious renovations may leave you facing a loss rather than a profit. ​Next week I'll discuss other important considerations for your renovation project. Top tips to avoid your renovation project turning into a disaster. How hard can it be to choose a paint colour? It seems easy to pick a colour, until you see the hundreds of colours available. There are literally fifty shades of white and fifty shades of grey! Then you select your colour from a piece of paper, purchase the paint, put it on the walls and it looks totally different from the colour you selected. That’s because paint can look entirely different with different lighting conditions, and even by what it’s paired with – like the colour of carpets, furniture and fittings. Then we haven’t even mentioned the family arguments, with everyone picking a different shade of white. So employing an interior designer, or a colour specialist, to provide advice on paint colours can be money well spent, although it’s obviously not a necessity. Fortunately many paint suppliers can provide this expert at no cost, providing you use their products. But some attempt more extensive renovations and construction work themselves without a proper design. This comes with some risk. What are the risks of designing your home? The design could be structurally unsound, possibly not taking the type of ground conditions into account. This could lead to cracking. Second floor slabs could sag, resulting in unsightly cracks and damages and uneven floor finishes. Poor designs can lead to poor layouts, which could include, the inefficient use of space, poor ergonomics, doors not being able to open (there have been many instances when doors to toilets couldn’t open because they clashed with the toilet, or there wasn’t space for the person opening the door to step out of the way), doors clashing and light switches being in the wrong place. The design could be unsafe, for example, steps could be of the wrong size, handrails could be insufficient or weak, structural elements could fail. Poorly designed buildings could result in problems, such as, leaking roofs, rising damp, leaky windows, poor lighting and blocked pipes. Poor designs can detract from the use and enjoyment of the house, even lessening the value of the house. The inefficient use of materials. Redoing work because of design mistakes. Poor coordination of services and utilities in the house which could result in clashes and items not fitting, resulting in extra costs to make the necessary changes so everything fits. A lack of a unified architectural style and theme, resulting in a patchwork of disjointed elements that don’t relate to each other. Problems with designs and drawings could delay permit applications. The work may not satisfy the building codes and specifications. This could mean that it has to be rectified, even demolished. Buildings that don’t meet codes won’t be able to be sold. It could even result in insurance policies being voided.Sometimes the authorities and lenders will insist that the house, or elements of the house, are designed by a registered designer. Poor design detailing may make the building look unfinished or a mismatch of patches. Designers do cost money and we're all out trying to save money. But spending money on employing the right professionals will save you money. Importantly they will often guide you in the right direction - helping to crystallise your ideas onto paper. They will help prevent those family arguments over colours and finishes. They should simplify your choices. Proper design drawings are often a prerequisite for obtaining building approvals. Poor drawings could delay the process, even leading to the rejection of permit applications. See my article on Selecting a designer for more useful information. When it comes to ceilings, whether it’s for your new home, renovation, or commercial space, there are many factors to consider, everything from your budget, the look, to the purpose of the ceiling – indeed, there’s more to the ceiling than being a cover over your head. Ceilings help insulate (both noise and temperature) the room below, they hide the structural elements of the house, they often conceal utility pipes and cables and they provide a decorative finish. In this article we examine the pros and cons of using drop-down ceilings in your home building project, also known as suspended ceilings, which are common in many commercial buildings and found in residences. In houses they are more typically used in basements because of their construction, cost and simplicity. These ceilings typically consist of a framework, normally metal tracks, which is suspended from the house structure using wires. Tiles or panels are then set or laid inside the tracks, forming the suspended ceiling. The most common ceiling tile used in drop-down or suspended ceilings is the acoustic tile. These come in various colours and finishes and varying qualities. For an eye-catching look various colour tiles can even be combined. Some tiles can be more easily wiped clean – which is useful after the maintenance team has been working in the ceiling. 1. Easy Installation – To install a drop-down ceiling, one needs to install metal tracks suspended by wires below the roof structure, then panels are laid or placed between the tracks – this is how the name “drop-down” or suspended ceiling came to be. Though it may seem simple to suspend the panels, installing the track work may require the assistance of a knowledgeable contractor. Many home owners intending to install the ceiling themselves can obtain the required knowledge from readouts and the internet, and they can purchase the materials from their local building supply stores. However, they need to maintain the safety of their home and ensure the ceiling won’t fall, while also ensuring that it’s aesthetically pleasing without sags when it’s finished. 2. Soundproofing – Drop-down ceilings can enhance the soundproofing of the room, either blocking noise from outside the house or from rooms above. Drop-down ceilings can be insulated with fibreglass, or similar products. 3. Concealing of wires, duct-work and imperfections – For the most part, drop-down ceilings are installed to hide wires, ducts and pipes, while providing easy access to the duct-work, wires and any other necessary building parts that require maintenance or check-ups. Similar to an access panel that provides easy and simple access to the ceiling space, drop-down ceilings do the same. 1. Loss of height and space – The biggest disadvantage of ceilings is that they reduce the height of a room by several inches (usually at least 8 to 12 but often more) to allow for the frame and wires. This could make the room appear smaller and the lower ceiling may interfere with the tops of windows, cupboards and furniture. 2. Quality – While drop downs are a cost-effective solution for a building, there are sometimes quality issues. They can over time deteriorate and change colours. This can be prevented with routine maintenance of the ceilings and panels and by ensuring there are no leaks leading to condensation or mould build-up. With time, poorly installed ceilings may sag. Frequent lifting of the panels to access the pipes and utilities in the ceiling space will lead to panels becoming damaged. 3. Not strong or sturdy – Generally the panels, framework and wires are lightweight. They can’t support heavy loads, such as a person’s weight, nor can they be used to support heavy light fittings or even ceiling fans, unless there’s additional support structures added. Ceiling tiles can be eye-catching, and a properly installed drop-down ceiling could be a feature of the room. It’s often a practical low-cost solution for your ceiling requirements, hiding the services and utility pipes and cables in the ceiling void, while providing easy access to them for maintenance. Using different types of tiles can convey varying styles to your room. However, poor installation and using cheap products could result in your ceiling deteriorating with time. Care must also be taken that your drop-down ceiling doesn’t look like a commercial office ceiling. These ceilings aren’t as strong as traditional ceilings and can easily be damaged. Drop downs are a great choice for basic buildings and for practicality – just remember to ensure it meets all your building needs. So, if you are thinking of replacing your current ceiling, or planning on a remodeling project consider the various ceiling types and what will be best suited to your needs, budget and what will best suit your room and style choices. When to start your home build and renovation project. Is now the right time? You probably can’t wait to start building your new home, or renovating your current home. But, is this the right time? There is much to arrange and sort out before construction can begin. Have you got sufficient finance? You don't want to run out of money part way through the job leaving you with a half finished project. It's often costly to restart the project later. You will run into legal and contractual problems if you can't pay your contractors. Will you have time to supervise construction, or visit showrooms to choose fittings and fixtures? If there’s a new baby coming soon, or you’ll be particularly busy at work for a few months you may want to delay the start. Even if you've employed a builder to take care of the complete project, there'll still be many decisions and selections to be made. Anyway, it's important to regularly check progress on the project to ensure that the work is of good quality and everything is as you expected it to be. What activities could impact the project? These could include planned holidays away, visitors who will stay over, and even big events, such as weddings or major birthdays. You might not want to be in the middle of renovations when friends and family visit! Are builders in your area busy? When there's lots of building work happening in your area then building suppliers and contractors are busy. Not only could there be a shortage of materials, equipment and skills, which could slow your project down, but suppliers and contractors will add more profit to your project when they price it - so you'll pay more. The best contractors may even be too busy to take on your project. But, when work is scarce suppliers and contractors often become desperate for work. There's a surplus of people. Building companies and suppliers will drop their prices, offer discounts, so that they can get your business. Delaying your project to a time when there's less construction in your area could mean that your new home or home renovation costs 10 to 15% less. When are the holidays? Many contractors close for a couple of weeks over Christmas which means your project will stand for several weeks. If you in the middle of a home renovation it could mean that your home is open to the elements for longer. What will the weather be? You possibly don’t want to be starting construction in the middle of the rainy season, or when it could be snowing. Ideally you’ll want to get the roof on before the onset of poor weather. Bad weather slows construction and the project will take longer. When can you get time off work? If you’re planning to do some of the work yourself you may want these activities to happen when you have time off work. Will all the materials and items for your house be available when required? If you've incorporated items and materials which have to be specially manufactured, or which come from other countries, then it could take several months for the items to arrive. You don't want to start construction, only for work to come to a halt when items aren't available. Is the design complete? You don't want to be waiting for information part way through construction. Contractors will charge standing time. The construction will take longer - adding to the costs. Are you happy with the design? Changing things during construction is expensive. Often work has to be redone to accommodate the changes and the project will take longer. Is everything in place for construction? Building on a new property will require a water and power connection - sometimes this can take weeks and months to arrange. If the builder has to organise a generator and water tanks there'll be additional costs for you. If you're doing a home renovation then usually furniture and other items have to be removed from work areas and things that could be damaged must be protected. Is access to the property available? Sometimes the local authorities are working in the area, digging up the roads, or possibly there's lots of other building work on neighbouring properties. This could make accessing your property difficult and slow down construction. On the other hand, starting work ahead of when your neighbours will start their building may make your construction easier. Are the planning approvals in place? ​Planning permissions – is the red tape sorted? Most construction work requires planning permissions from the local authorities. Usually there’s a fee payable to get your building plans assessed. Unfortunately some authorities work slower than you expect. Verbal promises of when you can expect to receive the permissions are often broken. Then, when you finally get feedback it’s to say that there’s a problem which you have to fix before the permission can be granted. Invariably this delays the start of the project. Starting the project before permissions are received could result in work being stopped, even work having to be torn down, or monetary fines to pay. If you’re responsible for obtaining all the permissions ensure that these are submitted timeously, in the correct format and with all the required supporting documentation. Employing an expert could speed up the process and prevent mistakes which cause delays. Talk to the authorities and ensure that you thoroughly understand their requirements. Give them exactly what they want – even more. Continually stay in touch with them to see that the process stays on track, and that paperwork hasn’t been lost. Don’t give your contractor a start date, only to find that you haven’t received permissions by this date. Your contractor may charge you standing time waiting for the permits and permissions. We all want to get our project started as soon as possible, but, it's important to check that everything is ready for construction so that the project isn't held up. Sometimes delaying the start of your building project may even make it cheaper. ​Carefully consider the best time to start your project. I’m a construction professional, author of several successful construction management books, and a home owner. I’ve made mistakes in construction management, I’ve seen others make mistakes, but importantly I’ve had multiple successful construction projects and I’ve learned from the mistakes. I want to share these lessons and my knowledge with you. Build and Renovate Your Home With Your Eyes Wide Open is my latest book. It's packed with tips and information to ensure your home construction project is a success. Get your copy today from Amazon and other online stores.